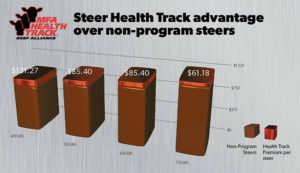 MFA Health Track is a Vac 45 preconditioning verification program for beef calves administered by MFA Incorporated for Cow/Calf producer customers. MFA Health Track can help you manage risk, manage health, increase sale price, control market timing, increase health, age and source verify and earn a premium at sale. Find out more about Health Track and how it can benefit your herd at Farmers Coop. Support – we audit and verify all processing claims and will make right any misrepresentations. Find out more about Health Track and how it can benefit your herd at Farmers Coop. This entry was posted on Friday, July 27th, 2018 at 4:06 pm	and is filed under Cattle, News & Updates. You can follow any responses to this entry through the RSS 2.0 feed. Both comments and pings are currently closed.